Posted by copesbj on Monday, November 28, 2011 in Articles, December 2011/January 2012. This year’s Vanderbilt Holiday Turkey Giveaway for full-time and part-time faculty and staff will take place on Friday, Dec. 16, at three locations: Langford Auditorium, One Hundred Oaks, and in Williamson County. At Langford the hours of the giveaway are from 6 a.m. to midnight, while at One Hundred Oaks the giveaway will be held from 7 a.m. to 7 p.m. 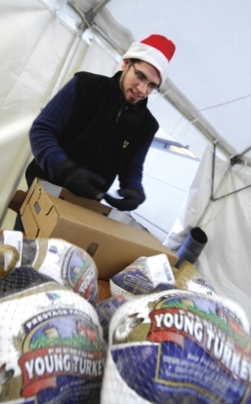 The Turkey Giveaway for employees based in Williamson County will be from 3 to 6 p.m. at the parking lot behind the 2105 Edward Curd Lane Building. The Turkey Giveaway is for both Medical Center and University employees, and in order to pick up your holiday turkey, you must show your valid Vanderbilt photo ID. Where should you go to pick up your turkey? 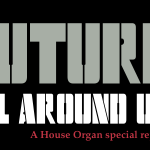 People whose work location is on the main campus and areas north of I-440, south of I-40, west of I-65 and east of West End Avenue, including on West End, should pick up turkeys at Langford Auditorium. All other Davidson County employees, including those at Green Hills locations, should pick up turkeys at One Hundred Oaks. Williamson County-based employees should go to the Edward Curd Lane location. The giveaway is limited to one turkey per person. There will be no rain checks or organized make-ups for people who aren’t at work that day, so if you plan to be off, it’s a good idea to plan to come by to pick up your turkey. Also, it’s important to remember that each person must pick up his or her turkey in person; a co-worker or family member cannot pick up a staff member’s turkey. There will be a limited number of Tofurkey Dinners, which will be distributed on a first-come, first-served basis. Unclaimed turkeys will be donated to Second Harvest Food Bank. A “turkey shuttle” will run that day between Kirkland Hall and Medical Center North (7 a.m. to 7 p.m.), as well as between the 25th Avenue Garage and Medical Center North (6 a.m. to 6 p.m.). Regular shuttle routes will also be in effect. The Round Wing drop-off will be closed on Friday, Dec. 16, except for patient access, mobility-impaired employees and shuttles. Open parking will be available in the 25th Avenue Garage after 3 p.m. that day. Alternative arrangements must be made in advance for mobility-impaired employees. Please contact turkeytoss@vanderbilt.edu. For more information, check the Employee Celebration website.